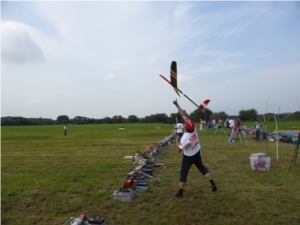 Model gliders which are suited for the F3B class have a wing span of about three meters and weight approximately two kilogramms. Such models are either produced in small series and can hence be bought or they are constructed by the pilots themselves by using ultra-modern materials. 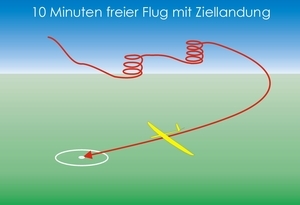 Three different tasks have to be fulfilled with one and the same model plane, these tasks are time trial, long-distance flight and speed flight. The first two of these tasks are carried out in groups, whereas the participants of the speed flight take off one after the other. Together these three tasks form one round; during the World Championships as many rounds as possible will be flown and this in always different combinations of the groups. During the competition the situation can be observed on a large score-board. The model gliders will be launched by means of electric winches. In order to guarantee equal opportunities, these winches are limited in performance. The ropes for take-off consist of Polyamid and their diameter lies between 0.9 and 1.4 millimetres. Depending on wind, weather and technical skills, heights between 180 and 340 metres can be achieved. During release, the model gliders are exposed to 30 times the earth’s accelerative force. Launch of a F3B model. The helper is throwing the model with as much power as possible. Within a time limit of twelve minutes up to ten pilots have to complete a ten-minute-flight with a final spot landing. Points will be deducted if the time limit is exceeded of if the landing is not exactly on the spot. The first one of each group gets 1000 points, whereas the points for the other competitors will be calculated in proportion to the winner’s points. 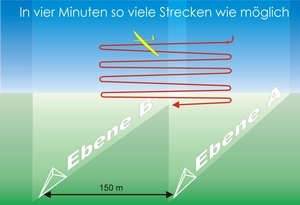 Within four minutes the competitor must fly over a distance of 150 metres as often as possible. Therefore the groups of up to five pilots get a time limit of seven minutes for tactical decisions. Once a distance of 150 metres is completed, the pilot will get acoustic an optical signals and a large score-board will provide all necessary information. Also here the winner of a group will receive 1000 points. The world record is 38 laps which means an acccumulated distance of about six kilometres. 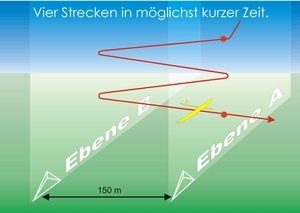 For this task a distance of 150 metres must be flown four times as fast as possible. This task must be fulfilled within four minutes. The time for the current world record is 11.9 seconds which corresponds to an average speed of more than 180 km/h. Also for the speedlflight a large board will indicate flight details and the winner will get the much wanted 1000 points.